Born in Havana in 1957, Gloria Fajardo was two when her family fled Cuba for Miami. Gloria suffered through a childhood marked by the Cuban diaspora. 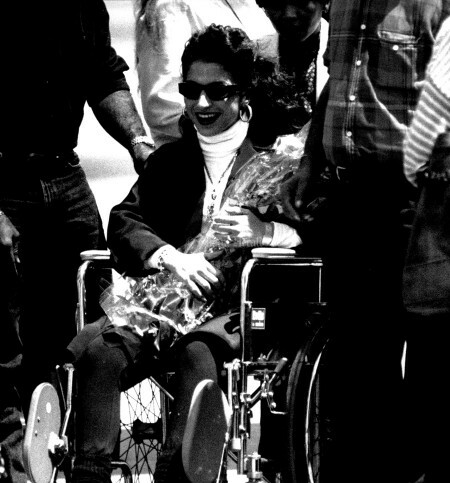 Her father joined the U.S. Army, fought at the Bay of Pigs and in Vietnam, later developing multiple sclerosis after exposure to Agent Orange. By the time Gloria was a teenager, her father couldn’t even recognize her. Her mother became the sole support for the family. Gloria started singing with the band that became Miami Sound Machine while working on her degree in psychology from the University of Miami. It was during these first years of Miami Sound Machine that she married Emilio Estefan and laid the groundwork for a Latin music empire. A seven-time Grammy Award winner Gloria became the most successful Latin crossover artist of all time. Her career almost came to a halt in 1990 on a snowy Pennsylvania highway during the Get On Your Feet world tour. A semi slammed into the band’s tour bus, fracturing Gloria’s spine, leading to fears she might be paralyzed for life. But after doctors implanted a pair of titanium rods to stabilize her spine, and after a year of painful rehabilitation, the singer resumed her globetrotting career. Gloria and Emilio Estefan have become authors, entrepreneurs who own a pair of hotels and a number of restaurants, minority owners of the Miami Dolphins, and multifaceted forces in showbiz. Their life story is now a successful broadway musical called “On Your Feet”, which opened in the fall of 2015. 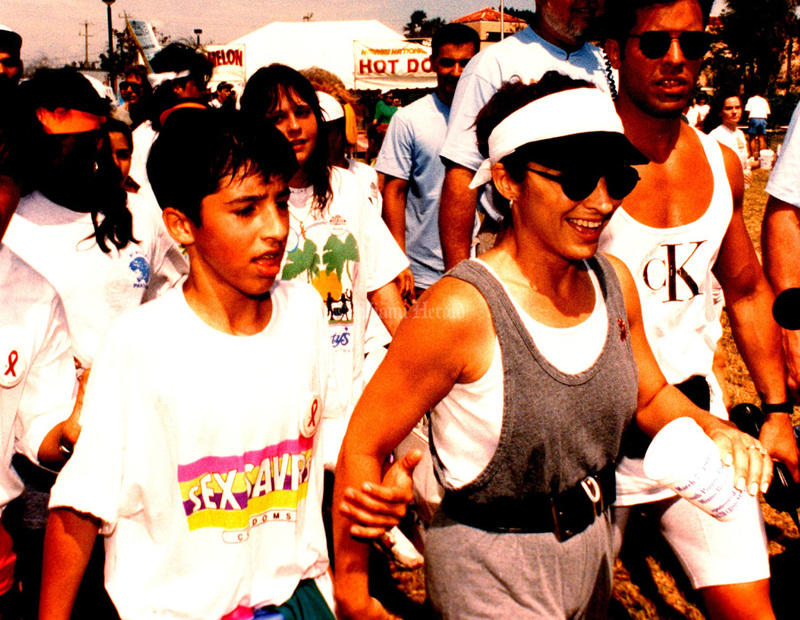 Undated, Hector Gabino/Miami Herald: Gloria Estefan and son Nayib participate in a local Aids Walk. 8/30/1996, David Bergman/Miami Herald: Gloria Estefan shares a moment in the locker room after the Pittsburgh show with fan Matthew Fabry, 15. She is signing multiple autographs for him, and he has flowers that he is going to give to her. Undated, Nuri Vallbona/Miami Herald: Gloria, Emilio and Nayib Estefan at their home. 1989: Gloria Estefan and the Miami Sound Machine. 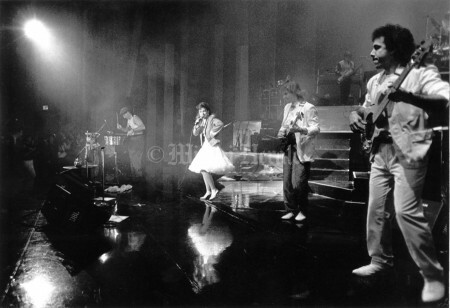 5/7/1987, Brian Smith/Miami Herald: The Miami Sound Machine perform their "Primitive Love" show at the Metropolis nightclub in Mexico City. 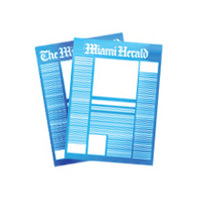 Undated, David Bergman/Miami Herald: Gloria Estefan. 1990, C.M. 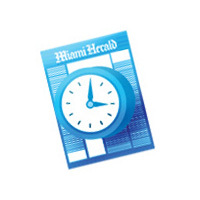 Guerrero/Miami Herald: Gloria Estefan arrives in Miami. 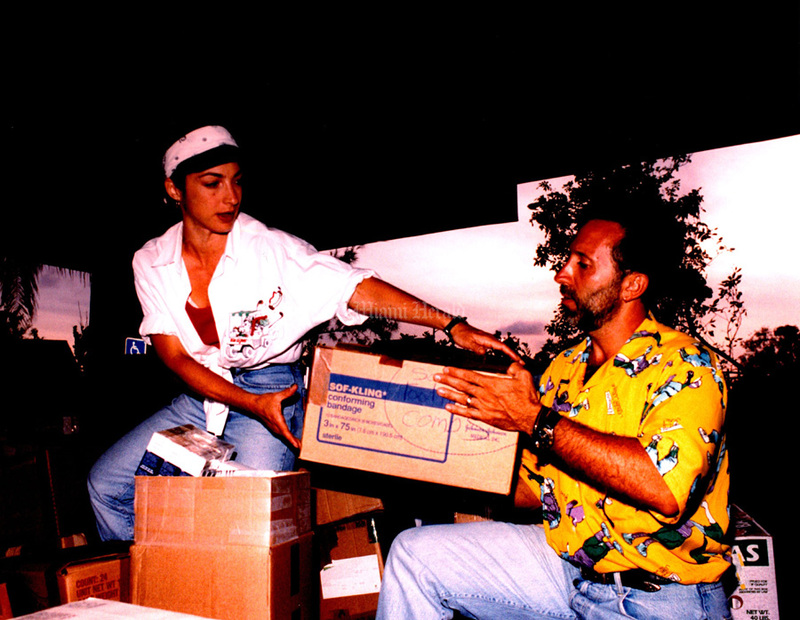 1992: Gloria and Emilio Estefan unload Hurricane Andrew donated goods. 1990, C.M. 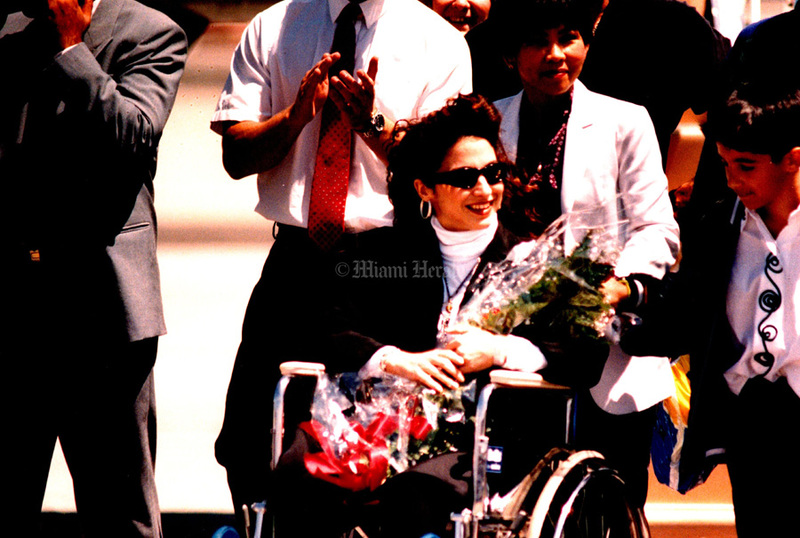 Guerrero/Miami Herald: Gloria smiles as she is led to the podium on a wheel chair. 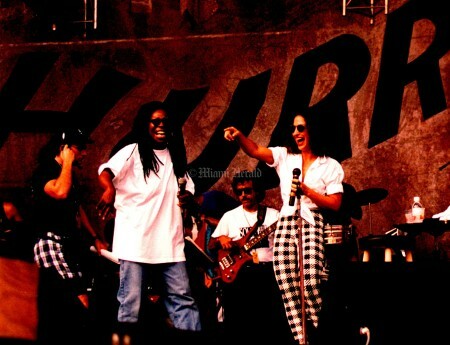 1992, Al Diaz/Miami Herald: Gloria Estefan (R) & Whoopi Goldberg (L) at the Hurricane relief concert hosted by the Estefan to benefit victims of Hurricane Andrew. 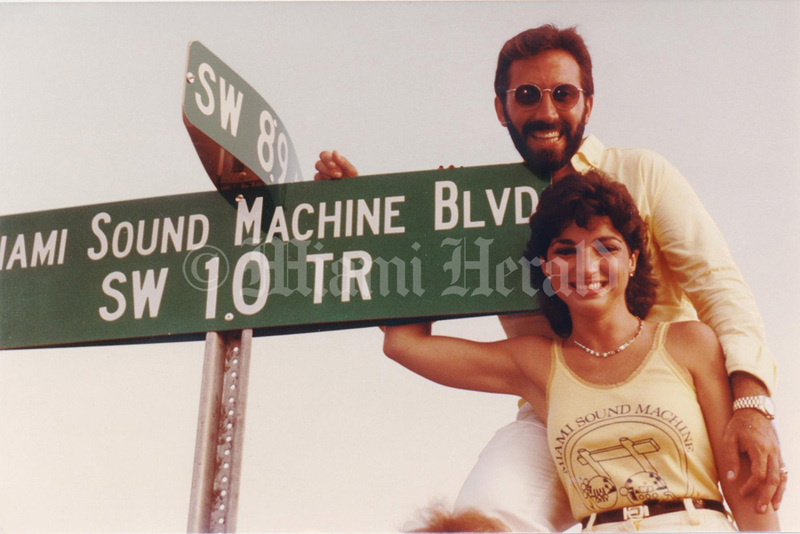 Gloria and Emilio Estefan, circa 1985, posing with SW 10th Terrace sign, after the street had be re-named: Miami Sound Machine Blvd. 5/7/1987, Brian Smith/Miami Herald: Gloria Estefan, beside husband Emilio, applies make-up while riding in a bus to Miami Sound Machine concert in Cuernavaca, Mexico. 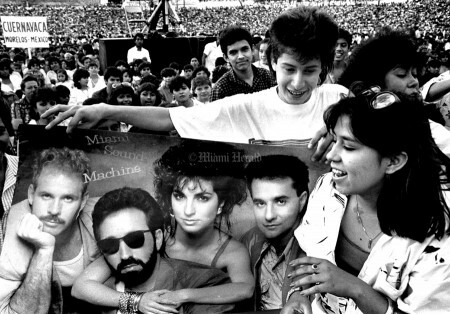 5/24/1987, Brian Smith/Miami Herald: Mexican fans of the sound Miami machine hold on of the bands 'Primitive Love' promotion posters passed out of the crowd before a TV taping in Cuernavaca, Mexico.